Joe McCaul helped Thomas & Taylor of Burgaw into this beautiful new 2016 Silverado Z71! Congrats to you both and welcome to the #JGCFamily! Chris Whitehurst welcomed this USMC Officer to the ‪#‎JGCFamily‬ who traded his 2015 Subaru BRZ for this certified Lifted 2014 Silverado! Congrats, Austin, and thank you for your service! Chris Whitehurst helped Alie upgrade her 2012 Honda Odyssey for a brand new 2016 Chevy Traverse! Congrats and welcome to the ‪#‎JGCFamily‬! Chris Whitehurst welcomed Lucinda of Tarboro, NC into the ‪#‎JGCFamily‬ with her beautiful new 2016 Chevy Malibu! Congrats and enjoy! Chris Whitehurst found Tammie B. of Leland just what she needed in this 2011 Dodge Grand Caravan! Congrats and welcome to the ‪#‎JGCFamily‬! Allen Lekocevic helped Gunnar, Tracy, & Marvin become happy owners of this beautiful certified 2015 Silverado Z71 with only 10,000 miles! Congrats and welcome to the ‪#‎JGCFamily‬! Joe Tassi came in looking for a crew cab truck and Allen Lekocevic helped him find this 2015 Ford F-150 with only 23,000 miles! Congrats, Joe & Susan, and welcome to the ‪#‎JGCFamily‬! Ryan Shumate helped Harold from Fayetteville, NC into his third new Silverado from Jeff Gordon Chevy! Congrats and thank you for being a loyal member of the ‪#‎JGCFamily‬! Joe McCaul welcomed Donald & Jean into the ‪#‎JGCFamily‬ and helped them upgrade from a 2011 to their new 2016 Chevy Equinox! Congrats and thank you! Joe McCaul helped Kyle G. of Carolina Beach into this beautiful new 2016 Colorado Z71 – a perfect truck to take out on the North End! Congrats and welcome to the ‪#‎JGCFamily‬! McRae Grady helped Robert S. trade in his 2012 GMC Sierra and make him the happy owner of this 2016 Silverado 4WD double cab! Congrats and welcome to the ‪#‎JGCFamily‬! Leslie & Mabry came from Sneads Ferry to trade in their 2013 Cadillac CTS. Joe McCaul helped them into this beautiful siren red 2016 Tahoe with those slick black wheels! And, they were able to save close to $4,000 using their GM Military Discount combined with other current offers. Congrats and welcome to the ‪#‎JGCFamily‬! Ken Dilks helped Cody & Kathleen into their 2013 Equinox AND 2010 GMC Canyon! Congrats on all your new editions and welcome to the ‪#‎JGCFamily‬! Chris Whitehurst helped Mike B. of Hampstead, NC upgrade his 2012 Ford Focus for this certified 2014 Chevy Malibu! Looks good, Mike! Welcome to the ‪#‎JGCFamily‬! Well, it’s had a good run, but Destiny decided it was time to turn in her 99 Acura. Allen Lekocevic helped her find this 2012 Sonic with the shiny tires at the price she wanted! Congrats and welcome to the ‪#‎JGCFamily‬! Shadon Miller’s very first customer, Julia, came back to see him again after just 5 months and is now the happy owner of this 2009 Toyota 4Runner! Congrats and thanks for being a loyal member of the ‪#‎JGCFamily‬! Allen Lekocevic welcomed this couple from Hampstead, NC to the ‪#‎JGCFamily‬ who traded their 2006 Jeep Wrangler for this 2010 Chevy Malibu LTZ! Congrats, Mike and Coral! Shadon Miller helped this happy couple from Fayetteville, NC trade in their 2013 Dodge Charger for this 2012 Wrangler with only 17,500 miles! Congrats and welcome to the ‪#‎JGCFamily‬, Ashley & Gavin! Shannon of Clinton, NC cleaned out her driveway this weekend! Chris Whitehurst helped her get rid of 3 older trucks with a lot of miles and replace them with this one beautiful Certified 2014 Silverado with only 26,000 miles! Congrats and welcome to the ‪#‎JGCFamily‬! Jack Tantum helped Daniel find the perfect vehicle to fit his needs and his budget in this 2014 Chevy Cruze! Congrats and welcome to the ‪#‎JGCFamily‬! Drew & Barbara stopped by to see about replacing their 2010 Honda CR-V and Chris Whitehurst helped them into their new 2013 Toyota Highlander! Looks great! Thank you and welcome to the ‪#‎JGCFamily‬! This U.S. Marine came to us all the way from Charleston, SC to trade his 2014 Honda Civic. Allen Lekocevic helped him into this certified 2015 Camaro SS with only 11,000 miles! Welcome to the ‪#‎JGCFamily‬, Cullen, and thank you for your service! Ben Frame welcomed Ashely T. into the ‪#‎JGCFamily‬, helping her into this 2014 Toyota Corolla! Congrats and enjoy! David G. of Carolina Shores, NC came to Wilmington on a 2015 Harley Davidson and drove home in this 2013 Silverado! Congrats and welcome to the ‪#‎JGCFamily‬! Joe McCaul welcomed Ronnie into the ‪#‎JGCFamily‬, trading the keys for his 2007 Pontiac Grand Prix for this All-New 2016 Chevy Cruze! He looks pretty happy about it, too 🙂 Congratulations, Ronnie! Bailey Pendarvis helped Donna & Jeff find the exact 2016 Traverse they wanted… It wasn’t on our lot at first, but we found one at another dealership and got it here for them! Congrats and welcome to the ‪#‎JGCFamily‬! Looking to lower his payments, Christopher came to Jeff Gordon Chevy to replace his 2015 Toyota Tacoma. Shadon Miller was able to get right where he needed with his certified 2016 Chevy Cruze Limited! Congrats and welcome to the ‪#‎JGCFamily‬! Shadon Miller welcomed Peggy & Robert into the ‪#‎JGCFamily‬ helping them into their Certified 2015 Chevy Sonic! Congratulations! Chris Whitehurst helped Josh H. into his first purchase from Jeff Gordon Chevy – A 2015 Nissan Frontier! Congrats and welcome to the ‪#‎JGCFamily‬! Chris Whitehurst helped Mike Bell find this 2010 Express Cargo Van for his Appliance Service company! Congrats and welcome to the ‪#‎JGCFamily‬! Marcos came down from Camp Lejeune looking to trade his 2001 Ford Mustang… Ken Dilks helped him into this beautiful 2012 Silverado! Congrats, welcome to the ‪#‎JGCFamily‬, and thank you for your service! Three thumbs up for Craig & Andrea’s third purchase from Brian Kane! They traded in their 2012 Traverse for a new 2016 Chevy Tahoe! Congrats and thanks for being loyal members of the ‪#‎JGCFamily‬! Aaron & Michelle of Jacksonville, NC needed a little more room than their Kia Optima provided… Allen Lekocevic found this 2011 Traverse for them with only 31,000 miles! Congrats and welcome to the ‪#‎JGCFamily‬! Allen Lekocevic & Widolph Edmond helped William & Renee from Havelock, NC get into their new 2016 Equinox LT which they were able to get over $5,500 Cash Back on at the very end of the 20% sale! Congrats and welcome to the #JGCFamily! Sharod Wallace helped Haley trade in her 2009 Honda Accord and purchase this 2016 Chevy Malibu LT – Beautiful! Congrats and welcome to the ‪#‎JGCFamily‬, Haley! Jacob Newman & Ken Dilks at Jeff Gordon Chevrolet welcomed Natasha & Eddie into the ‪#‎JGCFamily‬, helping them trade in their 2003 Chrysler Town & Country for this 2010 Jeep Grand Cherokee! Congratulations and enjoy, you two! Josh B. decided to turn his Honda Accord as well – Jack Tantum helped him into certified 2015 Chevy Sonic RS hatchback! Congrats and welcome to the ‪#‎JGCFamily‬! Chris Whitehurst helped Brad S. of Southport, NC trade in his 2011 Dodge Avenger for his new certified pre-owned 2015 GMC Terrain! Congrats and welcome to the ‪#‎JGCFamily‬! Chris Whitehurst welcomed the Davis’ to the ‪#‎JGCFamily‬, helping them find this Certified 2015 Chevy Traverse 2LT that perfectly fit their needs and budget! Congratulations and enjoy! Stephen, Alecia, and Joshua were looking for an extra vehicle with great gas mileage just for their commute – Chris Whitehurst helped them into this 2015 Chevy Spark! Congratulations and thanks for being loyal members of the ‪#‎JGCFamily‬! Ben Frame helped Kassidy into her first purchase from Jeff Gordon Chevy – A 2016 Chevy Trax that she got over $4,500 cash back on! Congrats and welcome to the ‪#‎JGCFamily‬! Allen Lekocevic & Widolph Edmond helped Justin find just what he was looking for in his new 2004 Silverado Duramax with only 91,000 miles! Congrats and welcome to the ‪#‎JGCFamily‬! Robert the Wilmington Chevy Guy welcomed this wonderful couple from Maple Hill, NC into the ‪#‎JGCFamily‬, helping them trade in their 2005 Jeep Liberty for a new 2016 Colorado Z71! Congratulations, Larry & Pam! Joe McCaul welcomed William to the ‪#‎JGCFamily‬, helping him into this 2016 Chevy Impala 2LT and saving over $6,700! Congratulations and enjoy! Adam & Katherine of Tarboro, NC got referred to Chris Whitehurst by their neighbor and are now happy owners of a certified 2013 Chevy Cruze! Congrats and welcome to the ‪#‎JGCFamily‬! Jenny L. of Jacksonville, NC came in to trade her 2014 Subaru CrossTrek for this beautiful new 2016 Colorado! Congrats and welcome to the ‪#‎JGCFamily‬! Bailey Pendarvis welcomed Samantha into the ‪#‎JGCFamily‬ with her all-new mosaic black 2016 Chevrolet Cruze! Looks good – Congratulations! Bailey Pendarvis helped Robert & Misty from Southport, NC into their first purchase from Jeff Gordon Chevy – This beautiful 2016 Colorado! Congrats and welcome to the ‪#‎JGCFamily‬! Ryan Shumate helped Lindsay trade in her 2011 Malibu and save over $6,100 on her new 2016 Equinox during the Chevy Summer Sales event! Congrats and welcome to the ‪#‎JGCFamily‬! Joe McCaul helped Tim H. of Oak Island, NC get out of his 2015 Silverado lease and into this irresistible 2016 Camaro 2SS Convertible! Looks good! Congrats and welcome to the ‪#‎JGCFamily‬! Ben Frame helped the Stricklands trade in their 2008 Dodge Avenger and get 20% Cash Back (over $2,900) on this brand new Toasted Marshmallow 2016 Spark! Congrats and welcome to the ‪#‎JGCFamily‬! Check out these photos of our new and returning customers with their new & pre-owned vehicle purchases at Jeff Gordon Chevrolet throughout the month of March! James Chirico helped Rudy from Goldsboro, NC into his brand new 2016 Silverado Z71! Welcome to the #JGCFamily and happy Truck Month! Ken Dilks at Jeff Gordon Chevrolet helped Steven & Emmy of Currie, NC into their GM Certified 2015 Chevrolet Cruze! Congrats to you both and welcome to the #JGCFamily! Joe McCaul just helped Stephen & Claire into a brand new 2016 Silverado 2500HD High Country Diesel! Welcome to the #JGCFamily and happy Truck Month! Chris Whitehurst helped Luis and Frank trade their 2013 Nissan Altima for a brand new 2016 Chevy Silverado! Congrats and welcome to the #JGCFamily! Allen Lekocevic & Chris Whitehurst helped Holly say goodbye to her Audi S5 and hello to her new 2014 Dodge Durango! Congrats and welcome to the #JGCFamily! Brenda with her mom and her new ride – A certified 2015 Chevrolet Cruze! Happy day! Congrats and welcome to the #JGCFamily! Ryan Shumate helped Jason trade his 2015 Jeep Wrangler for his new 2015 RAM 1500! Congrats and welcome to the #JGCFamily! Adam Vitale helped Chasity and her adorable Abigail trade their 2011 Ford Escape for a certified 2015 Malibu! Congratulations and welcome to the #JGCFamily! Patrick Hamm and James Chirico helped the Stump Family into their 3rd purchase from Jeff Gordon Chevrolet in less than a year – A 2016 Silverado Z71, lifted and fitted by our friends at Down East Offroad. Congrats and thanks for being loyal members of the #JGCFamily! Brian Kane helped Helen & Benjamin from Sunset Beach, North Carolina upgrade from their 2014 Buick Enclave to a 2016 Chevrolet Tahoe! Congratulations and welcome to the #JGCFamily! Chris Whitehurst helped Jessie from Florence, SC trade his 2012 Camaro for a 2015 Ford F-150! Welcome to the #JGCFamily and enjoy your ride home! Yadira just made her first purchase from Jeff Gordon Chevy – A GM Certified 2015 Chevy Cruze! Congrats and welcome to the #JGCFamily! The Garcias are proud new owners of a Midnight Edition 2016 Silverado Z71! Beautiful truck. Congrats and welcome to the #JGCFamily! Shadon Miller helped Norma and Frank from Ash, NC into their 2014 Dodge Grand Caravan! Congratulations and welcome to the #JGCFamily! Celia & Kenneth just made their 4th purchase from Jeff Gordon Chevy (2nd from Chris Whitehurst) – A 2014 Nissan Maxima! Congrats and thank you for being loyal members of the #JGCFamily! Brian Kane helped Warren turn in his 2014 Equinox and start a new lease a 2016 Equinox! Congrats and welcome to the #JGCFamily! Shadon Miller welcomed Eric & Britney into the #JGCFamily with their 2010 GMC Sierra! Congrats to you both! Chris Whitehurst helped Eric get his son, Tyler, a sweet 2009 GMC Sierra! Lucky kid! Congrats and welcome to the #JGCFamily! Chris Whitehurst helped Stephen from Whiteville, NC into his shiny black certified 2015 Malibu! Congrats and welcome to the #JGCFamily! Brian Kane helped Marine Staff Sergeant, Daniel, trade his 2013 Ford Explorer for a beautiful 2016 Silverado 2500HD! Thanks for your service and welcome to the #JGCFamily! Chris Whitehurst welcomed another new member to the #JGCFamily, handing the keys to BJ for his new 2011 Ford Escape! Congratulations! Sherry traded her 2011 Mazda 3 for a brand new 2016 Chevrolet Malibu, making it her second purchase from Jeff Gordon Chevy! Congrats and thanks for being a loyal member of the #JGCFamily! Allen Lekocevic helped Tammy trade her 2013 VW Passat for this much more powerful 2012 Chevrolet Camaro SS! Congrats and welcome to the #JGCFamily! Chris Whitehurst helped Erica find the perfect vehicle to upgrade from her 02 Toyota Sienna and is now a happy owner of a 2011 Dodge Grand Caravan! Congrats and welcome to the #JGCFamily! James Chirico just delivered Jimmy’s new 2016 Chevy Equinox to his home in Wallace, North Carolina! Congrats and welcome to the #JGCFamily! Don drove all the way from Ohio to Jeff Gordon Chevrolet in Wilmington, NC to trade his 2015 GMC Sierra 2500 for a brand new 2016 Silverado 2500HD Diesel! Thank you and welcome to the #JGCFamily! McRae Grady helped Nathan and Natasha into their 2016 Chevy Equinox! Perfect! Congratulations and welcome to the #JGCFamily! Austin Briggman helped Lynn & Jeffrey trade their 2013 GMC Yukon XL for their 2012 Toyota Sequoia! Congrats and welcome to the #JGCFamily! Chris Whitehurst helped Curtis from Cerro Gordo, NC into his first purchase from JGC – A GM Certified 2014 Chevy Cruze! Congrats and welcome to the #JGCFamily! Chris Whitehurst helped Linda trade her 2010 Honda CR-V and upgrade to a beautiful Certified Pre-Owned 2015 Silverado double cab! Congrats and welcome to the Family!! Ryan Shumate welcomed Don and his wife from Bolivia, NC to the #JGCFamily with their new 2016 Chevy Cruze Limited! Congratulations! James Chirico helped Jerry from Rose Hill, NC into his 2016 Silverado 2500HD! Welcome to the #JGCFamily and enjoy! Ricky upgraded his 2014 Silverado to a brand new 2016, making for his 3rd new truck purchase from Chris Whitehurst in 3 years! Congratulations and thanks for being a loyal member of the #JGCFamily! Shadon Miller helped Chris and girlfriend Lauren find him the perfect vehicle in his GM Certified 2015 Chevy Sonic! Congrats and welcome to the #JGCFamily! Chris Whitehurst helped Lee, Kayla, and the family from Mount Olive, NC trade their 2013 Chevy Impala for a 2014 GMC Sierra Crew Cab! Thank you all and welcome to the #JGCFamily! Vanessa came to Jeff Gordon Chevrolet from Raleigh, NC to upgrade her 2013 Camaro for this jaw-dropping #CamaroSIX SS in mosaic black metallic. A big congrats to you and welcome to the #JGCFamily! Joe McCaul helped Steve upgrade his 2013 Ford F-150 for this certified 2015 Silverado! Congratulations! Sammie Sanders Sr. (some relation!?) met Sam Saunders at the gas station while he was fueling up a vehicle for delivery. Being in the market for a truck, the only natural thing for Sammie to do would have been to come to Jeff Gordon Chevy to Ask4Sam… Now he’s the owner of this 2008 Silverado that’s the same color as Sam’s Tahoe, of course! Welcome to the #JGCFamily, Sammie! James from Winnabow, NC came to see us about a truck for his plumbing business – Chris Whitehurst helped him into this 2013 GMC Sierra 3500HD! Thank you and welcome to the #JGCFamily! Todd, Amanda, and the kids came back Jeff Gordon Chevy to trade their 2007 Saturn Ion for their 2012 Kia Sportage! Congrats and thanks for being loyal! #JGCFamily! Carolinne came to see Chris Whitehurst after her previous vehicle was totaled – Now she’s the happy owner of a 2013 Honda Accord! Congratulations! Chris Whitehurst helped Michael upgrade his cargo van from a 2005 GMC Savannah to a 2016 Chevy Express! Congrats and welcome to the #JGCFamily! Just a few of our new and returning customers with their new & pre-owned vehicle purchases at Jeff Gordon Chevrolet throughout the month of February! One of our service techs, Ralph, and his wife April are happy owners of a certified 2015 #ChevyCruze! Congrats! All thumbs up for David and his new champagne silver 2015 Malibu! Welcome to the #JGCFamily! Trey Malowany helped Tyra & Eric from Conway, SC into their first purchase from Jeff Gordon Chevy – A certified pre-owned 2014 Malibu! Love that ashen gray metallic! Congrats and welcome to the#JGCFamily! Jason traded his 2014 GMC Sierra for this sweet 2016 Chevy Silverado 2500HD! Happy#TruckMonth and welcome to the #JGCFamily! Ryan Shumate helped James trade his 2005 Mazda Miata for his new Electric Blue 2016 Chevy Spark! Congratulations and welcome to the#JGCFamily! Sharod Wallace helped Shirley into her third purchase from Jeff Gordon Chevrolet – Trading in her 2012 Impala for a new 2015! Congrats and thank you for being a loyal member of the#JGCFamily! Hands down, we think Bradley just won Chevy Truck Month with his 2016 Silverado 3500HD High Country. Congrats! RJ Parks-Brown helped Juan into his new 2016 Chevy Malibu – Making it his 3rd purchase from Jeff Gordon Chevy! Congrats and thanks for being a loyal member of the #JGCFamily! Shadon Miller helped Julia out of her 2002 F-150 and into her 2013 Honda CR-V! Fantastic! Welcome to the #JGCFamily! And congrats to Shadon on his first sale in just 1 week of being with the JGC Pre-Owned team! Brian Kane just helped Joyce upgrade from her 2008 Pontiac G8 to a new summit white 2016 Malibu! Congratulations! Jack Tantum helped Shannon trade her 2007 Toyota Camry for a this GM Certified ’15 Cruze – perfect! Welcome to the #JGCFamily! Anthony’s celebrating Chevy Truck Month big time with his new 2016 Silverado Z71 with lift kit, wheels, and tires installed by the great people over at Down East Offroad! We like your style! Congrats and welcome to the #JGCFamily! Shadon Miller just welcomed Eric to the#JGCFamily, handing the keys over to his new 2008 Chevy Suburban! Congratulations! 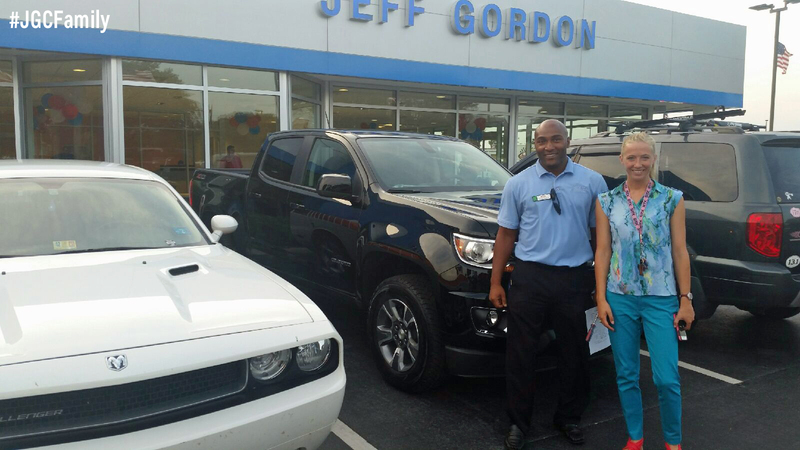 Shadon Miller helped Allexus from Supply, NC into her first purchase from Jeff Gordon Chevy – a 2015 Dodge Journey! Congratulations and welcome to the #JGCFamily! First time customers, Thomas & Tiana, are proud and happy owners of this 2012 Nissan Maxima! All they had to do was Ask4Sam! Congrats and welcome to the #JGCFamily, you two! Bob visited us for the first time to trade his 2004 Ford Escape and left with his new 2010 Ford Flex! Congrats and welcome to the #JGCFamily! Allen Lekocevic helped Curtis upgrade from his 2000 Silverado into this 2011 Ford Ranger! Congrats and welcome to the #JGCFamily! Ryan Shumate helped Erik, an active-duty Marine, into his first purchase at Jeff Gordon Chevy – A Certified 2014 Silverado! Welcome to the#JGCFamily and thank you for your service! Ryan came back to Chris Whitehurst to trade his 2011 Tahoe for his 2011 Ford F-150 FX4! Even better, Ryan was able to keep (almost) exactly the same payment! Thanks for being a loyal member of the #JGCFamily and enjoy! Christian just made a green switch by trading in his Toyota FJ Cruiser and purchasing a 2013 VW Jetta Hybrid! He’s also served our country for 15 years, and for that we’re honored to welcome him into the#JGCFamily. Chris Whitehurst helped first-time customers, Deborah and Renee from Southport, into their certified pre-owned 2014 Tahoe! Congratulations and welcome to the #JGCFamily! Jack Tantum was able to find just what Andrea and David were looking for and now they own this 2009 Subaru Outback! Congrats and welcome to the#JGCFamily! Allen helped Jessica upgrade from a 2004 Toyota Camry to a 2013 Cadillac ATS! Amazing! Congratulations and welcome to the #JGCFamily! Chris Whitehurst helped Gunner from Nakina, NC into his certified 2015 Chevy Cruze! Congrats and welcome to the #JGCFamily! Jack Tantum helped Doug from Shallotte, NC into his 2011 Malibu with plenty of room for friends! Congratulations and welcome to the #JGCFamily! Chris Whitehurst helped Billy upgrade his truck – Trading his 2003 Silverado for a 2012! Congrats and welcome to the #JGCFamily, Billy! Colton came to see us for his first vehicle purchase and Chris Whitehurst helped him into a certified 2015 Chevrolet Cruze Limited! Congrats and welcome to the #JGCFamily! Chris Whitehurst welcomed Greg into the#JGCFamily, helping him trade his 2012 Honda Ridgeline for this new 2016 Chevrolet Cruze Limited! Congratulations! Kelli just purchased her 2nd vehicle from Chris Whitehurst, trading her 2008 Suburban for this beautiful 2015 Chevy Tahoe LTZ! Congrats and thanks for being a loyal member of the#JGCFamily! Chris Whitehurst welcomed Phillip and his family into ours, helping them into their GM Certified 2015 Equinox! Congrats to you all! Bobby and Betsy drove all the way down from New Bern to buy their son his first car – A 2007 Toyota FJ Cruiser – Lucky kid! Congrats and welcome to the #JGCFamily! Chris Whitehurst helped Ray into his second truck from Jeff Gordon Chevy – A 2015 Silverado in Deep Ocean Blue Metallic – Beautiful! Thanks for being a loyal member of the #JGCFamily! At Jeff Gordon Chevrolet, we like to think of our customers as members of the family and take pride in the relationship after the sale. Here are the photos we were able to snap this January of both new and returning members of the Jeff Gordon Chevrolet Family. Congrats to all of you and enjoy your new rides! Heidi started the New Year off right trading in her 2011 Honda Pilot and leasing a beautiful new champagne silver metallic 2016 Chevy Malibu! Congrats and welcome to the #JGCFamily! Chris Whitehurst helped Gary and Lori into their certified 2013 Silverado today! Congrats and welcome to the #JGCFamily! Jack Tantum helped the Hudsons into their new family car – a certified pre-owned 2015 Malibu! Looks good! Welcome to the #JGCFamily! Thanks to some help from Robert the Wilmington Chevy Guy, Darlene found the perfect vehicle in her brand new 2016 Chevrolet Cruze Limited LT and is loving it! Congrats and welcome to the #JGCFamily! Allen Lekocevic helped Evan find an affordable pre-owned Silverado to replace his Lincoln Town Car! Looks good – Welcome to the ‪#‎JGCFamily‬! Chris Whitehurst just helped Briana (who came all the way from Jacksonville, NC) into her 2007 Sebring! Congrats and welcome to the‪ #‎JGCFamily‬!! Darnell came to see Brian Kane to pre-order his ‪#‎CamaroSIX‬. After a couple of months anxiously waiting, we were finally able to hand him the keys! (We bet it was worth it =) ) Congrats and welcome to the ‪#‎JGCFamily‬! Jean & Kenneth did a 2-for-1 trade, turning in their Silverado and Camaro for a new 2016 Chevrolet Suburban! A big congrats to you both and welcome to the ‪#‎JGCFamily‬! Al & Joann met Ryan Shumate yesterday to talk about trading their 2001 Grand Marquis. They returned today new members of the ‪#‎JGCFamily‬ and owners of a beautiful 2016 Equinox! Congratulations! Brian Kane helped Patrick trade his 2003 Avalanche for a brand new 2015 Silverado 1500! With his GM Military Discount combined with other current offers, he saved OVER $8,800! That’s huge! Thanks for your service and welcome to the ‪#‎JGCFamily‬! Ryan Shumate helped Jeanette and John into a beautiful 2015 Chevrolet Camaro! Congrats and welcome to the ‪#‎JGCFamily‬! Stephen Hooper helped Reginald & Nicke upgrade their 2010 Equinox for a 2016 Chevy Traverse! Congrats and welcome to the ‪#‎JGCFamily‬! Sharod Wallace helped Richard upgrade his 2013 Avalanche for a brand new 2016 Silverado! Thanks for being a loyal member of the ‪#‎JGCFamily‬! Chris Whitehurst helped Joshua and Bliss trade their 2012 Jeep Patriot for something a little bigger – their 2011 Chevy Tahoe! Congrats and welcome to the ‪#‎JGCFamily‬! RJ Parks-Brown got Najee into a certified pre-owned 2015 Malibu and we got another new member of the family! Congrats and enjoy, Najee! Ken Dilks at Jeff Gordon Chevrolet welcomed Sheila to the ‪#‎JGCFamily‬who came to trade her 2001 Maxima and is now the proud owner of a certified 2014 Equinox! Congratulations! Chris Whitehurst helped AJ trade his 2008 Jeep Patriot for his 2013 Toyota Corolla, which is not only 5 years newer, but we were also able to lower his payment! Congrats and welcome to the ‪#‎JGCFamily‬! Sharod Wallace helped Jerome and Rita upgrade big time, trading in their 2002 Kia Optima for a brand new 2016 Chevrolet Cruze Limited! That’s amazing – Congrats and welcome to the ‪#‎JGCFamily‬! Joe McCaul helped Jeff trade his 2010 Mini Cooper and is now leasing a beautiful new 2016 Chevy Malibu! Congrats and welcome to the ‪#‎JGCFamily‬! Michael just made his first purchase from Chris Whitehurst at Jeff Gordon Chevy and is now the proud owner of a 2015 Ram 1500 Big Horn! Damon purchased just purchased his second vehicle from Jack Tantum at Jeff Gordon Chevrolet and traded his 2007 Jeep Wrangler for this sweet 2011 Silverado! Congrats, Damon and thanks for being loyal! Chris just got back to the states from deployment in Romania and we were honored to welcome him to the ‪#‎JGCFamily‬ by helping him into his new 2013 Ford F-150! Congrats and thank you for your service! Allen Lekocevic helped John and Kim upgrade from their 2006 Jeep Grand Cherokee for this 2015 Chrysler Town & Country! Congrats and welcome to the family!! This military family outgrew their 2009 Toyota Sienna and in just one visit,Chris Whitehurst helped them into a 2013 Ford Explorer AND a 2012 Expedition! Congrats John and Shiang-Ling! Jack Tantum welcomed Samantha into the family and helped her into her certified 2013 Chevy Malibu! Congratulations! The Bowens have been relying on their 2004 Chevy Suburban to help them run their Whiteville, NC HVAC business since they purchased it from Jeff Gordon Chevrolet in 2003! They came back just a little over a decade later and left with this beauty – a diamond white 2015 Chevrolet Suburban! Looking good you two! Thanks for being loyal members of the #JGCFamily! Check out all of the Jeff Gordon Chevy Family Photos from this year. Zatha from Hampstead, NC came to see Sharod Wallace to upgrade her 2010 Dodge Challenger and left Jeff Gordon Chevrolet with a brand new 2015 Chevrolet Colorado! Definitely a beautiful truck! Welcome to the #JGCFamily! Update 7/21/15: We just received Zatha’s great review about her shopping experience at Jeff Gordon Chevy and her new Colorado! As soon as I came on to the lot, Sharod immediately came to my assistance. He was receptive to what I were looking for and was able to quickly get the keys to a Colorado so I could test drive it. He was extremely knowledgable about the entire vehicle, and knew all of its capabilities extensively. After going home to think about the purchase, I decided to get the Colorado and came back the next day. On my way over Sharod informed me that it had already been sold, but he was able to arrange for me to meet with Ben to pay a deposit to secure one of the Colorado’s coming in the next shipment! Ben was also extremely helpful with the initial purchase process. Once the truck came in, Sharod was able to quickly finalize the purchase, efficiently get me through the paperwork process and hand over the keys. After the fact, Sharod capably arranged the truck bed liner and painting of the Chevy Bowties. I appreciate all the efforts of Scott, Nick, Ben and especially Sharod in making my first official vehicle purchase such an enjoyable and exciting experience!